The innovative dance company Keigwin + Company comes to the Kennedy Center for a brief engagement this weekend. The vaguely retro, colorful makeup and clothes in this addictive video – not to mention the runway-ready hair – remind me of some of the best spring trends. Hey, all of you last-minute-lovers: it’s the day before Valentine’s Day, but all is not lost. If you are reading this blog, the person you love (or the one who loves you and knows you well enough to read this blog) will love this ready-to-go gift idea: H.Bloom’s exclusive Simon Doonan Valentine’s Day bouquet. It includes a Simon-curated arrangement, a signed copy of his new book and a Jonathan Adler “Vidalia” bud vase, all for $125. Flowers wilt (though H.Bloom’s seem to last forever), but vases are forever, plus this book is laugh-out-loud hilarious and witty, as are all of Doonan’s books and columns. Here are hubbies Simon + Jonathan (together for nearly 20 years) at the book launch at the W I attended the other week. Simon is wearing a signature Liberty print floral shirt – all the more appropriate that he’s collaborating with a flower company. H.Bloom will take deliveries til noon tomorrow. You’re welcome! UPDATE: After Valentine’s Day, the company plans to make the arrangement available til the end of the month. Tomorrow at the Corcoran, local artist Holly Bass will perform “Moneymaker”–involving a faux derriere, a sick soundtrack of soul jams and old-school interviews and recordings, and these amayzing Americana platforms (just snapped this–she’s rehearsing as I type! )–in an all-day “endurance performance” that involves her dancing in a glass box above the main entrance to the museum above people’s heads. All day. Seven hours. With no breaks. It’s in celebration of our amazing, landmark show 30 Americans. You should come (before or after the B+C sale, of course) and shake your booty! Details, including a livestream link, and the most retrofabulous photo ever, here. 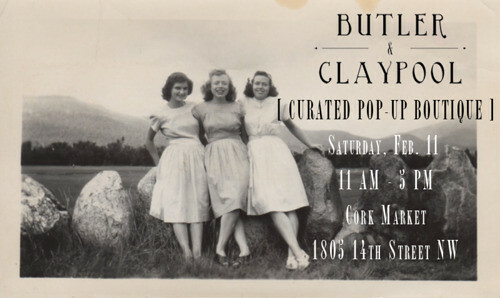 The ladies and I are throwing another Butler + Claypool vintage shopping event this weekend, from 11 AM-5 PM at Cork Market’s Tasting Room. We’ll be bringing out our best women’s AND men’s vintage clothing, accessories, and more. I’ve been hoarding since the last event in the summer and can’t wait to pull out my finds. We’ll be setting up shop in the private tasting room and offering winter and spring wares a selection of our handmade wearables, hot cider, music and fashionable chatter.